This post is brought to you by Genworth in collaboration with Brandfluential. Over the last few months I have discussed important life planning topics with you, including the importance of having and maintaining life insurance, and the importance of saving for your future. However, it wasn't until after my most recent post on retirement planning that I actually decided to delve into what I would need to do to start planning for my own future. When doing some research on the Genworth site, I ran across some common myths surrounding the topic of retirement, and I thought I would share a few with you, as they were pretty insightful. 1. Your most important concern should be the money you need to get by in retirement. Actually, your most important concern should be how you want to live. Do you want to just settle down in a smaller home, or do you want to see the world and go on more expensive vacations? You should choose the way you want to live in retirement and then start planning how much you should need from there. 2. Believing that your 401k plan and your Social Security will be enough. Recently, I read an article on US News about "12 Important Retirement Planning Deadlines," that discussed important milestones you should be hitting in your effort to save for your retirement. Just putting a bit away in a 401k every year and relying on Social Security payments could mean that you are left without a way to provide for yourself in retirement. 3. Retirement means you have to disengage from life. Retiring doesn't mean that you have to withdraw into your home, lose contact with your friends and give up in life. In fact, it can be a first class ticket to doing all of the things you have always wanted to do, but didn't have the time for. It can also allow you more time to become more social in your community and make new friends. What steps are you taking to make sure you are ready for retirement when the time comes? 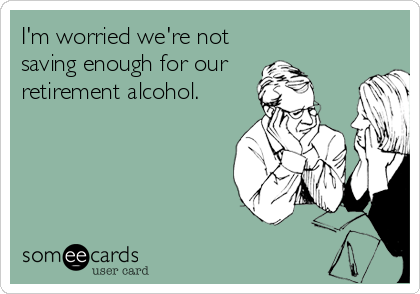 I had to laugh at the ecard about retirement alcohol! LOL! I'm in the beginning stages of planning now and even though I feel like I'm starting way late, it's better than nothing at all! This is something I actually have a plan for. I'm going to do it in a little less than two years. I'm looking forward to it. They're modest plans, but they are plans that will make me happy. LOL unfortunately those quotes are so true. Currently we are working on buying a home and working on getting it paid off in 15 years instead of 30 so we will not have a mortgage payment when my husband is ready to retire. Unfortunately, that last one sounds about right. I don't think I'll ever have enough, and SS is on its last legs. 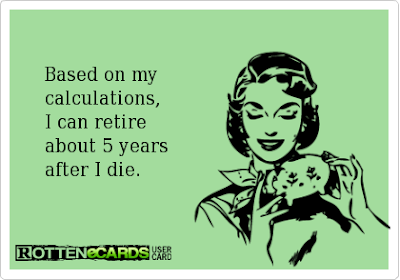 When I was working I put the maximum into my retirement account. When I got a raise I never noticed because I put that amount in. My house is paid off. Bought my car with cash. I have lots of fun volunteering. I love how you added a bit of comedy but it's so true. My mother in law hasn't saved anything and my fil freaks. She DID just get a huge amount of money after her parents passed and already blew a quarter of it somehow. I really hope she decides to save for her future. That's one gig we think we've been planning well for! We have savings for retirement in numerous different investment vehicles, so all our eggs are not in one basket, and our mortgage should be paid off by then too. Retirement is starting to scare me more than a little bit – for much of my career until now my income was variable and we were just making ends meet. I'm setting aside money now, but I need to be more aggressive if we're going to keep the lifestyle we have now! We really need to start thinking about this. We were sitting here the other day talking about how our daughter will be going off to college in 4 years, and we're just not ready for it. We started thinking about the important stuff way too late! Great post. I love the ecards. I need to focus on figuring out a retiring plan. I really need to start giving retirement more thought so I can be prepared. I like how you busted the myth of knowing how much money you need. It is probably easier to plan based on how you want to live after retirement. We need to get more serious about our retirement. The last one cracked me up. That nervous kind of laughter when something is actually sadly true. But hopefully we can change all that soon! Do people really think you have to disengage from life to plan for retirement?! We need to get more serious about our retirement planning, but we have started. Right now I think we could afford the retirement alcohol...and that's about it. I think we need to sit down and really start planning. It's hard to motivate yourself when you're not "retirement age" yet - but that's the key: doing it before you HAVE to do it. My husband and I have started discussing our options and he has a 401K with his employer. There are so many options and I am thankful for people like Genworth who make retirement planning easier. I really need to start thinking about retirement. It's so scary to think about. I'm with Jenn - I totally laughed out loud at the alcohol retirement card. Thanks for debunking some of the myths I've heard! Provided my husband gets to keep his job until retirement, I think we'll be okay with his pension to keep us going through monthly expenses. It won't include the dream vacations we want to take, so we're in the process of making those financial plans now. The e-cards are hilarious, but make a point! I'm really hoping we can retire before we need to buy burial plots, hence why all this planning is so very important! That first comic is so true. Nobody ever says they saved too much for retirement. In fact, it's usually quite the opposite. These made me LOL. Yeah, what 401K? Sigh. Hah! Those quotes are a riot, but sadly quite true too. I suggest buying up loads of alcohol now while it's cheaper, so you can truly enjoy it in your retirement. I love those ecards, they make such a scary topic fun! 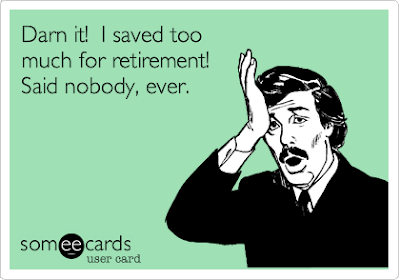 We are doing a lot to save for retirement, but not ENOUGH. We're looking into other options. Right now my husband is just putting money back in his 401K. 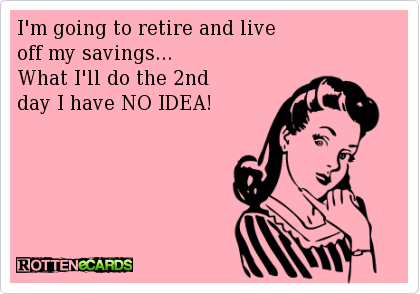 thinking about how much I will need to save to retire and live comfortably for 20 or 30 years is terrifying! There is so much to think about before that time comes! SO what type of accounts do you recommend investing in for retirement? I am in my early 20s and have no clue! I found an article here http://www.mutualfundstore.com/planning-and-retirement/assess-your-situation/retirement-assessments that talks about investing in mutual funds, you seem knowledgeable, what do you think?